Nose transplant? 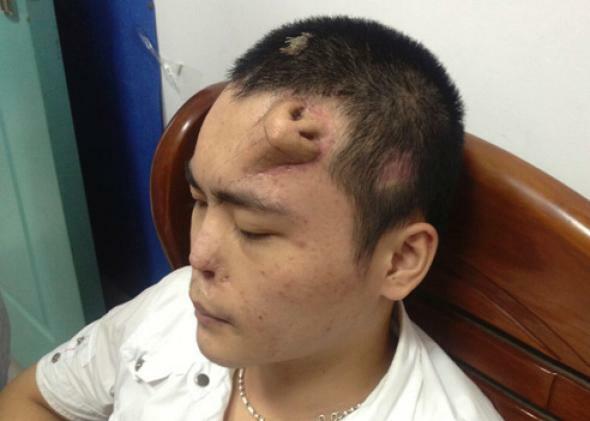 Chinese man Xiaolian grows extra nose on forehead. Xiaolian’s new nose is pictured at a hospital in Fuzhou, Fujian province on Sept. 24. Citing local media, Reuters and the BBC report that doctors in China’s Fujian province have helped a young man grow a second nose on his forehead. The 22-year-old man, identified by Reuters only as Xiaolian, apparently had his first nose disfigured in a traffic accident last year, but didn’t get it treated. Over time it became infected, inflicting irreparable damage. Doctors responded with the obvious workaround. “The new nose is grown by placing a skin tissue expander onto Xiaolian’s forehead, cutting it into the shape of a nose and planting a cartilage taken from his ribs,” Reuters explains. The idea is to eventually transplant the new nose to the traditional spot in the middle of the patient’s face. There’s a lot that could go wrong, Byrne said. But if all goes well, Xiaolian’s new nose should work nearly as well as its predecessor. In the future, he added, doctors may be able to grow noses and ears in a laboratory before transplanting them onto people’s faces, which sounds far more practical for patients who’d prefer not to look like a Picasso portrait incarnate. This story should also serve as a public-service announcement to go ahead and get that traumatic nose injury treated if you’ve been putting it off for some reason.